A couple of weekends ago I went to Washington, D.C. with eleven girlfriends for my friend Kristy's bachelorette party. We had so much fun shopping, eating and dancing the night away. We all brought some snacks and tasty beverages with us to enjoy before we went out that night. Guess what I brought - Cupcakes! I was worried about how they would travel since we had a two hour drive, and the fact that each car held four women and all the stuff that women need to bring for a night in D.C., so I decided this was the perfect opportunity to make Cupcakes in a Jar. I saw these all over blog land earlier in the year and I was reminded of them again when I was browsing on Joy's Hope. So I ran to Wal-mart and purchased a case of 8 oz. Quilted Jelly jars and these pretty pink forks. I already had the fabric from Joann's, so I traced circles on the back of the fabric with a cereal bowl as my guide. I used the Salted Caramel Cupcake recipe I recently posted about and my go-to Buttercream Frosting recipe. I put an unfrosted cupcake in the bottom of the jelly jar and then squeezed some frosting on top using a pastry bag with a star tip. Then I sprinkled Heath Toffee bits on top of the frosting, drizzled salted caramel over the frosting and stuck another cupcake on top. Easy peasy and so cute! While we were shopping we tracked down Georgetown Cupcake. I really wanted to try their cupcakes, but the line was so long and we had lots to see and do. I totally asked a stranger if I could take a picture of the cupcakes they just bought. My teenage daughter would have died of embarrassment right then and there, but hey these cupcakes have their own T.V. show! Maybe the owners, Katherine and Sophie will read this and feel bad that I didn't get to try their cupcakes and send me some! Wishful thinking!!! What a great idea!!! I love it! Now when people ask if I can ship them some cupcakes, I totally can! Thanks for the tip! What a neat idea! I love Cupcake Girl's (the show) Their cupcakes are gorgeous! These cupcakes look worthy of a dream or two! Looks like you had a really fun trip. Love the cupcakes in a jar. Thanks for stopping by! Hah! I almost peed my pants when I read this post. I live near here and go to the library next door almost once a week with the kids. Since that show I can barely get the stroller down the sidewalk! I love this idea for the jars- I will have to try it since I know I won't stand in line for G'town cupcakes! LOL, hey you can hope! :) I'm keep my fingers crossed for you. Great idea on the cupcake in a jar idea! I'm gonna keep it mind for the holidays. Thanks so much for visiting me & for the comment! Love your site! Can't wait to try out some of the recipes. Yum!!! You are a lucky girl! I have tried their cupcakes and they are beyond delicious. I love you cupcakes in a jar. Where I have been? this is the first time I have seen them. Adorable cupcake idea! Looks like you had a fun getaway!!! Oh my gracious - that is brilliant! I've never seen those before! So totally cool! I'm bookmarking this! I must try it! Thanks for sharing!! Following you from the Friday Hop! The brownies in a jar look delicious...how fun! Come link up to my party at PonyTails&FishScales! I love this idea and can't wait to make some for teacher gifts this year! Totally love these cupcakes in a jar, and the cupcake show!! those are the cutest thing ever! Love that idea!! LOVE this! Just found it via @jenjentrixie on Twitter, and saw that you linked up on my BFF's blog with this post...I'll bet it ends up being linked to all over the place. I love me some cupcakes! Your cupcakes in a jar make a super cute gift. I'm visiting from Amanda's party and I'm a follower, too. Have a great weekend! DELICIOUS! I love cupcakes, and your cupcake in a jar is a genius idea! I'm gonna have to keep that in mind for future reference! Stopping by from Amanda's party! Hi there - just discovered your amazing blog, and I love your cupcake-in-a-jar idea! You might like my fudgy-brownies-in-a-tennis-ball-can recipe! If I've enticed you, please visit my blog at http://altered-artworks.blogspot.com Looking forward to following you! I want to be your friend so you will bring me cupcakes in a jar! How cute are those??? This is the cutest idea EVA! Wow, what a delightful treat:) I'm thrilled to be your newest follower! Can't wait for more great posts! Fantastic.. I double hearts this idea!! 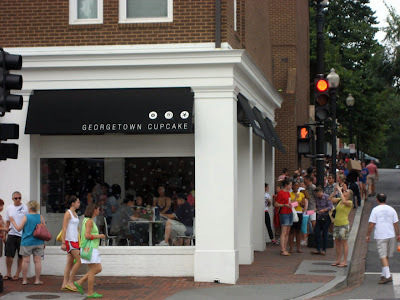 I live in D.C. and I can't stand Georgetown cupcake for that reason. We have at least two other cupcake places in town that are great too. Hello Cupcake! and Red Velvet Cupcakery. Red Velvet is at 7th and E near Chinatown. There is pretty much never a line and the cupcakes are so good I take every out of towner there! We're planning to make a day of it and try all three for a fair comparison! Jenny...I'm with you on Georgetown Cupcake...I went once when there was no line, and honestly, the cupcakes aren't that great. I've never had Hello Cupcake or Red Velvet Cupcakery....but the BEST (in my opinion) in DC is Baked and Wired on Thomas Jefferson NW between 30th and 31st. So delicious!! The one that's in Union Station (is it called Crumb!?) is really good, too. Next time you're in DC...go to Baked and Wired! Check out their website - http://www.bakedandwired.com It has great pictures.